Here are my Structo table looms all ready for the campers later in June. Last year we had great creativity from the 6-11 year-olds. Finally a use for my looms that have been gathering dust n my studio. Last year was a great success so we are going to do it again this year. I always wonder before hand how it will go over. The kids last year were so eager. I made the warps–2 1/2″ wide and then cut cut them off when they are all done and glue the cut ends. To set up the looms Front-to-Back, I had to have a couple of my books open to certain pages placed around the room. Patricia Townsend who teaches that method to high school students wrote the chapter and planned the illustrations. I have to say all my questions were clearly answered and the steps clearly accessible and understandable. I can now see why it is easier to teach. For these little looms and short warps, it was the right way to go. Her chapter is in my book, Weaving for Beginners where there are also a chapters on rigid heddle looms and hand manipulated structures—all written by experts because I only know Back-to-Front thoroughly. The computer chapter was written by Nancy Alegria and Debra Holcomb.There is another camp coming up this week. You can think of me under the trees with these great kids. This was what I found when I opened Facebook this morning. Hooray! People are finding good things in my books. This was in the 4-Shaft Weaving group on Facebook. It’s a technique/trick I use often when my fine silk threads at 96 epi break. In my book for beginners I dedicate quite a bit of space to finding and fixing errors. This illustration can be found in two places: pages 110 and 320. The first one is about checking for errors when the loom is set up and weaving the heading. Page 320 is in Chapter 13 “Troubleshooting”. After I posted the testimonial from Ken Berg raving about my warping method a few people have asked me what my system for setting up the loom is. Make two crosses when you make the warp. One for threading the heddles and one for loading the raddle (a group cross). Instead of making a warp chain, wind the warp on a kitestick. Load a raddle–not too coarse. Wind the warp onto the warp beam under a lot of tension. Tie on the warp to the cloth apron rod. tangled and broken threads. Front-to-back is not suited for such projects. The entire process is given in my book, Weaving for Beginners and is also on my DVD. My previous books are more like references with much more detail and reason why. Book #1 tells about making the warp (plus sett, planning). Book #2 tells about putting the warp on the loom. Book #3 tells about weaving. I gave a lesson the other day about planning projects and gave out the worksheet my students have liked and that is in my book, Weaving for Beginners. I thought it would be good to share it. It is used to calculate the many things needed when planning a project. This worksheet lets you figure out how long and wide the warp should be and the amount of warp and weft yarn you need. When I was starting out, I was always worried that I’d forget a critical calculation. I’ve used it with my students for many years so I don’t worry that I’ve forgotten a calculation they needed for their projects. You may download the worksheet HERE. Here’s another comment on my poll whether to publish my books as eBooks. See more comments. I appreciate any thoughts and comments. What’s Your Opinion? Would weavers want my books as an E-book? Do you think it would be a good idea for me to have my weaving books made as E-books? Emails like that really make my day. I appreciate them so much. Do you know that there is a whole chapter on rigid heddle weaving in my new book, “Weaving for Beginners”? 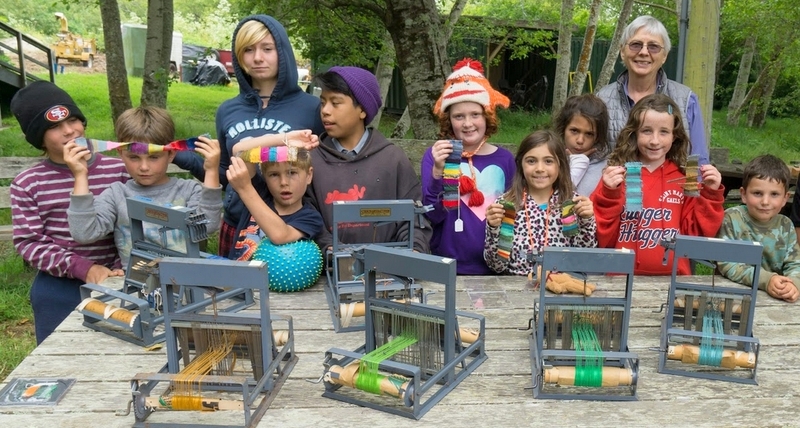 These looms are very popular with knitters and would-be weavers. I’m mentioning it because a friend told me he had gotten a rigid heddle loom and hadn’t realized I had included it in my book. Also, I want you to know it so can have it in mind so you can recommend it to others. They are really fun to use! Warping takes minutes instead of hours or days. Today a weaver (former student) and a student (a super beginner) came to see my show. The now-weaver, former student brought me wonderfully gorgeous things he had made! Was I ever proud! What pleases me greatly about being a weaving teacher is that none of the students’ work ever looks anything like what I weave. Each one does interesting and original projects. That is thrilling. Now he is learning double weave and I wondered if he had read my chapter about it. He hadn’t realized it was in my new book, Weaving for Beginners. I always loved to teach double weave to what I called, “virgins”. I wanted to be the one who introduced them to the subject. See my tip about double weave. My other visitor is a motivated “beginner”. She bought a small floor loom that I found in a second hand store. Today she went home with some of my “stash”–it was wonderful to find such a good home for my extra equipment. I gave her a warping board, an electric bobbin winder, a wooden swift, a ball winder and best of all–a doubling stand. I think two boat shuttles went home with her after her previous lesson. See the tip about the doubling stand. Someone wrote to ask if I was giving up teaching weaving when I give up one room of my studio. I still teach privately in my weaving studio. There is still space for that. I love seeing people one-on-one. When I retired I decided a book for beginners was necessary for my good methods to get out to potential weavers. My new book, Weaving for Beginners, came out mid June and has been a huge success. I’m hoping that it along with my other three books will take the place of my teaching classes and workshops. Also, my DVD on setting up the loom is helpful. So, you see, you can not have me and have me, too. See descriptions of all my books and DVD here on the blog or order on my web site: http://www.weaving.cc. Let me know if these suit you. PS There are two wonderful reviews of my new book here on the blog. Use the Search button to find them. I received a question about weaving the Rep Weave portion of the sampler in my new book, Weaving for Beginners, on Page 127. ANSWER: Remember, in rep weave, there are two sheds and they always alternate. There are never two consecutive rows of weft that cover exactly the same threads. The look of the cloth is a solid color, but the 1,2 shed ALTERNATES with the 3,4 shed. The solid color is achieved when you use the same color weft for BOTH sheds. With this weave the wefts pack down so you can’t really see the two rows because they appear as one row. So, just remember, always change sheds and alternate them–never repeat the same shed twice. See two important tips for Rep Weave in the weaving Tips Category. My student today had trouble seeing the floating selvedges. I got the idea to make the threads in a contrasting color! I never thought of doing that in all my years of teaching! It’s so much fun being able to dream up solutions after so many years. Read more in the Weaving Tips section of the blog. More on weighting separate selvege warps begins on page 306 in my new book, Weaving for Beginners. All about floating selvedges can be found beginning on page 304. Here is another review of my new book. I couldn’t have asked for anything better. It’s from The Journal for Weavers, Spinners and Dyers and Sue Dwyer is the author. www.thejournalforwsd.org.uk. I got a question about blocks in “twill diaper coverlets”. Diaper is a term that means the textile is patterned in an all over design. Often it is in small diamonds. In Twill Diaper Coverlets the principle is based on warp face (3/1) twill contrasting with weft faced (1/3) twill. In other words the blocks woven in either 1/3 or 3/1 twill. Each block requires enough shafts to make twill (so that means 4 shafts are needed per block). Let’s say the blocks that are weaving pattern will be in 1/3 (weft faced) twill and those in the background are 3/1 (warp faced twill). Read about profile drafts in my new book Weaving for Beginners, and in Book #3 Weaving & Drafting your own Cloth (in the Drafting for Multi-shaft chapter beginning on page 236. )Read on. Beautiful examples of these coverlets are in the book, “Keep Me Warm One Night” by Burnham & Burnham. They look like overshot coverlets, but instead of being overshot weave structure (which needs only 4 shafts to make 4 blocks), they are woven in twill diaper (where each block needs 4 whole shafts and a 4-block design would then require 12 shafts). For the pattern blocks instead of weft thread floats, the blocks are woven in weft faced twill (1/3 twill). This is not a beginner’s weave but the concept is the same as block substitution anywhere. You start with a profile draft and plug in the weave structure that you want to use. Read about block substitution in Weaving for Beginners and Weaving & Drafting Your Own Cloth. Counting string isn’t in the new book! I discovered that a student needed to use a counting string when making the warp for her very first project! I’ve put a note to myself to add it when the book is reprinted. See the tip: Counting String. a chenille scarf. Later chapters suggest future projects for the beginning weaver, explore hand-manipulated weaves, and teach the basics of rigid-heddle weaving. for determining sett using grist, diameter, and weave structure; tips for good selvedges and diagnostics for poor selvedges; and well-illustrated, step-by-step instructions for repairing a fixed thread or threading error, finding a lost cross, or fixing weaving mistakes—all are designed to get the beginning-to-intermediate weaver off to a smooth and confident start. reader started. In the final chapter of the book, Osterkamp answers your questions about what knot to use when and relieves all knot anxiety: snitch knots, lark’s head and double half hitches are all revealed through excellent illustrations. After you finish reading the “rabbit hole story,” you will never forget the weaver’s knot again. Please share your thoughts about this post in the “reply” or “comments” section below. To ask Peggy a question please go to the “Q & A” page of this blog.